As a follow up to 3Dwalkthroughs.com ‘s last post about an unbelievable sales center for a new high end development project, I couldn’t help but wonder why more effective takeaways were not offered. As per our last post, the sales center itself was amazing, complete with a fully built one bedroom unit. In addition there were impressive 3D Walkthroughs and 3D Renderings being shown on a huge plasma screen TV. My questions is this, if these 3D assets were already created, why were they not integrated into takeaway marketing packets? The sales center did a great idea to generate an emotion and the sales team had an opportunity to maintain this emotion by offering takeaways to those in attendance. Moving forward, perhaps they will take my advice and create these takeaways for new potential buyers visting the sales center. Last night members of 3Dwalkthroughs.com went to a cocktail party to launch the opening of an unbelievable sales center for a new property. We are not at liberty to discuss the brand but lets just say the showroom was a full blown replica of the unit, elevator and all. The whole front part of the show room was the actual sales center with a model of the development. On one of the walls was the biggest plasma TV I have ever seen. The TV was looping 3D Walkthroughs and 3D Renderings of the property. The company that created these did an amazing job and really got the attention of all in attendance. Apparently each unit will have its own elevator, so to demonstrate this they actually had a real elevator built which had both sides open. As you exited on the other side of the elevator you were able to experience exactly what it would be like when you entered a unit. I cannot imagine how much it cost to put this showroom together but it certainly did the trick in terms of making an impression. We heard they actually signed 2 contracts right after the event. Talk about effective marketing. 3Dwalkthroughs.com has been asked quite often recently if we are noticing a slide in our business due to the tough real estate climate. The truth of the matter is that almost all industries are affected in one way or another. I do not think anyone could have predicted just how dire the situation would have become over the last few weeks. While we are still getting new inquiries, the quantity has diminished somewhat, as has the types of projects coming in. We have had recent discussions with many of our real estate/developer friends and clients and the general consensus is that there is still more negative news to come. Our company is still optimistic that marketing directors continue to look for innovative tools such as 3D Floor Plans, 3D Walkthroughs and 3D Renderings to help make their properties stand out from the competition. The question remains though if they do more than just browse. A new X-ray technique could possibly revolutionize the detection of breast cancer, say an international team of researchers. The scientists responsible for this invention claim that this would allow 3D visualizations of the breast and help in early detection of tumors. According to an article posted on MedIndia.com, the new technique will allow for a more precise view of the breast tissue. Currently 10%-20% of breast cancer cases are not identified with the widely used mammogram. The research of this new 3D technology known as Analyser-Based X-ray Imaging (ABI), with high spatial resolution, will appear today in a Radiology journal. 3Dwalkthroughs.com came across an interesting technology that will be integrated into the Sears.com website, making them the first retailer to apply both a visual search and 3D virtual model to an entire catalogue online. The technology behind the Sears.com website upgrade is powered by the combined efforts of My Virtual Model and IBM. We did a little research on My Virtual Model and their website/solutions they offer are very impressive. My Virtual Model is one of the few companies that have really nailed it with regards to creating an application with real business value. The website list 4 solutions utilizing their technology. BrandME– Allows users to create a 3-D virtual model of themselves, and use this model to try on clothing from participating apparel companies. 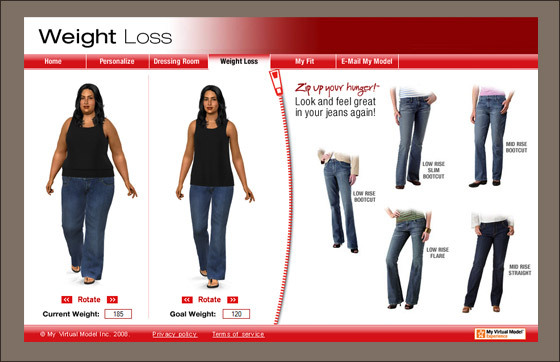 Dressing Room– Lets customers use their own 3D model to “try on” outfits and see how they look before they buy. We recommend checking out their site as they seem to have something to offer many industries. You are currently browsing the 3D Walkthroughs blog archives for September, 2008.